I am just getting over a nasty cold. By my side through many hours of the fight has been my “Kleenex Buddy” (as my wife calls it), a brightly colored box of tissues. What is unique about this box is that it has Chinese characters on the side which, supposedly, mean “Good Fortune”. I know, I know; it is just a cold. It isn’t SARS or Swine Flu or Typhoid or the Whooping Cough or the Black Plague. But when you’re sick, you’re sick and it is a tall order to see where Good Fortune is hiding amid the increasing pile of snot-filled detritus littering the floor at your feet. 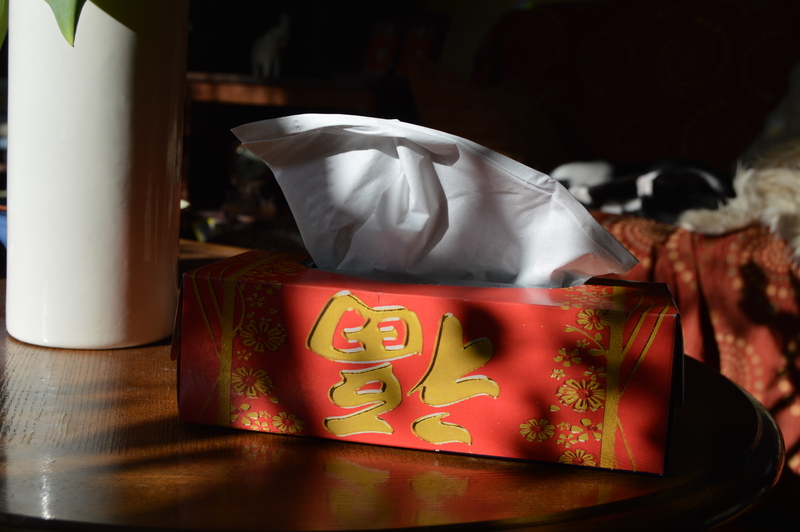 However, having to look at that tissue box for the last few days has got me thinking: What does Good Fortune mean anyway? Luck? Fate? Seems like a nice thing to wish on someone but it is awful tenuous. It doesn’t feel very solid or sure; like the “Have a Nice Day” you receive in the robotic tone from the underpaid and underworking young person at the grocery checkout. If my life really depended on Good Fortune maybe, possibly, hopefully happening but maybe not… well, that is just a bit depressing. And why should I experience Good Fortune when my neighbor just received a diagnosis of cancer or the guy I know at church rolled his car in a ditch or a family member of mine struggles with a debilitating mental illness? Maybe I’m dwelling too deeply on my Kleenex Buddy. Maybe all that snot-expelling loosened up my brain a bit. It’s likely. Have I experienced Good Fortune in life? It’s hard for me to say “Yes” to that because Good Fortune feels accidental and I don’t believe things happen accidentally. Sure, there are accidents in life and these include happy accidents. But even then I don’t believe those are somehow outside the plan, outside the purpose of my life. I don’t believe in an impersonal something that either does or does not bestow good things on my life. I believe in a personal God who is Good; and that God has a plan for me. Does that mean I understand it all, that I don’t have doubts, that I feel solid and sure every waking hour that my life is in His big and capable hands? Of course not. My life is like your life: At times it feels like I’m almost touching heaven and at other times like I am totally adrift in a leaking life raft in the middle of the ocean, surrounded by circling sharks the size of semi-trucks. But choosing to believe in a Good God instead of Good Fortune puts my life under the auspices of the One who is love, who doesn’t create anything by accident, who doesn’t get blown back and forth by the whims of Fate or by my pathetic human whims either. By believing in this Good God do I mean to say that nothing but good will come my way? No. Hell, no. I don’t believe in a Good God who has my personal happiness as his #1 priority. I believe in a Good God who has a Master Plan for all of Creation and I just happen to be an infinitesimal but integral part of what He is up to. That thought makes me feel very humbled and exalted all at the same time. Weird but true. God loves me but it also is not about me. He knows me personally but my personal fulfillment doesn’t trump the Fullness of His purposes. More deep thoughts coming from a box of tissues. That rattling sound you hear is my brain. I could be diagnosed with cancer one day. I could have any untold number “bad” things happen to me in the days, months, years I have left. That still doesn’t change the Good about my God. And it doesn’t change the good about my life. I have been deeply loved by so many people. I have an awesome family that laughs long and loud and sings together. I have felt the profound love of one woman who I am bound to in this trip through life together. I have seen my two kids being born and have experienced the extreme sport that is fatherhood. I have traveled to Africa, Europe, around North America. I have climbed to the top of Pike’s Peak. I have created artwork and acted on stage and banged on guitar strings while singing my lungs out with a “Hey, Ho”! I have preached the Word. I have been witness to the death of my Mom and not been afraid. I have felt so much Good, so much God. I have lived. That is enough. Life is never easy for anyone. But it can be so Good. Life can blindside you with trouble. But God’s eyes are always on you. That is solid. That is sure. That is what I choose to believe. So Good Fortune to you? Nah… I’ll wish you instead a lifetime supply of a Good God for however long that lifetime is for you or for me.